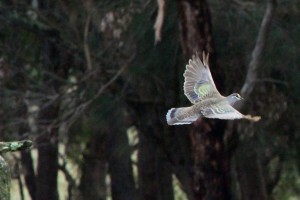 I heard a bronzewing pigeon clapping for the first time. Apparently lots of pigeons clap their wings, but I have never heard it before – or at least known what I was hearing. They do it to confuse and startle any predators that get too close as they make a quick exit. Shorty obviously got too close to a pigeon on the ground as we went to feed the guinea fowl and it flapped and clapped away.